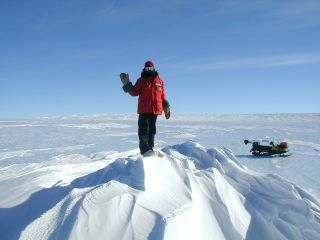 NASA astronaut Stan Love waves while participating in a meteorite hunt in Antarctica during a 2004-2005 expedition by the Antarctic Search for Meteorites Program at Case Western Reserve University. The astronaut ventured back to Antarctica in December 2012 for more meteorites. NASA astronaut Stan Love is having a hard time right now. Not in space, but on the forbidding East Antarctic Ice Sheet. Together with a group of dedicated volunteers, Love is looking for meteorites — rocks from space that have fallen to Earth. And it's not your usual vacation. "Being on the Antarctic ice is very much like being in space," Love told SPACE.com in December over dinner at the American McMurdo Station on the coast of the frozen continent. "Without proper protection, the environment would kill you within a few hours, and there's little hope of rescue if something goes terribly wrong." Love has been in the astronaut corps for 14 years. In 2008, he paid a two-week visit to the International Space Station on the space shuttle mission STS-122. As a management astronaut, he is now involved with so-called spaceflight analog programs: terrestrial experiments and expeditions that pose similar challenges as a journey into space. NASA's two main space analog programs are the underwater NEEMO (NASA Extreme Environment Mission Operations) base off the Florida coast, and DesertRATS (Research And Technology Studies) in the Arizona desert. "But ANSMET [Antarctic Search for Meteorites] is much more space-like than these two," Love said. "If an emergency occurs in DesertRATS, you can be in a hospital within three hours. In the case of ANSMET, it might well take three days." NASA astronaut Stan Love poses with a meteorite found in Antarctica during a 2004-2005 expedition by the Antarctic Search for Meteorites Program at Case Western Reserve University. He ventured back to Antarctica in December 2012 to seek out more space rocks. ANSMET started back in 1976. The program is funded by NASA, the National Science Foundation and the Smithsonian Institution, and is led by geologist Ralph Harvey of Case Western Reserve University in Cleveland, Ohio. Every austral summer, small volunteer teams head off to a remote region of Antarctica to set up a simple, self-contained field camp. For six weeks or so, they search the bluish ice for conspicuous dark rocks that might be extraterrestrial in origin. Thanks to the effect of exposed or sub-glacial hills and mountains on the slow motion of the ice sheet, meteorites that have fallen over the past tens of thousands of years are concentrated and pushed up toward the surface, where they're pretty easy to spot. "I also joined the ANSMET team in the 2004-2005 season," Love said. "My eyesight is still quite OK, and I found lots of meteorites. Which, by the way, basically means I was lucky." ANSMET doesn't offically keep track of who found what — all meteorite finds are considered to be the result of a team effort. Scientists work to gather meteorites in this scene from a recent meteorite-hunting season of the Antarctic Search for Meteorites Program run by Case Western Reserve University. But why would an astronaut go meteorite hunting? "First of all, I like it here," Love said. "Eight years ago, it surprised me how much Antarctica appeals to me." But there's more. Love said his astronaut training and experience could be useful for the ANSMET team. Just like the crew of a spaceship, the meteorite hunters are a small group of interdependent people, working for weeks on end in a very isolated environment, with all the social and psychological challenges that might show up. "I called Ralph [Harvey] and offered to come along for a second time and share my experiences," Love said. "The timing was perfect: Ralph had just been considering a suggestion by some isolation researchers to provide his team members with some kind of teamwork/leadership training." Getting along well with each other is not just more enjoyable, according to Love — it could be crucial to the success of the expedition. "If the social environment gives you a lot of energy, everything goes smoother. However, if it takes a lot of energy, everything is harder — you've got less energy left for your actual work, for risk awareness, etcetera." Moreover, years of training have convinced Love that, surprisingly enough, good chemistry between people is really trainable. "Feeling comfortable with your tent companion is something that you can actively gain. Of course, my family would laugh if I told them I plan to teach this kind of stuff. They'd say I'm breaking the rules every day." During the second week of December, the ANSMET group left McMurdo for an unexplored region at the head of the Beardmore Glacier, on the west side of the Transantarctic Mountain Range. This time, the meteorite hunters set up their camp in two or three different locations, while a special reconnaissance team searched for new hunting grounds farther south. Of course, Love said, there are also many differences between ANSMET and spaceflight. "With ANSMET, it's the extreme cold that permeates every aspect of life. With spaceflight, it's the microgravity. But in terms of team size, isolation, and resupply and rescue challenges, they are very similar." Another important difference is that every space mission is led and guided by Mission Control down on Earth. "ANSMET is much more autonomous," Love said. 'The decision makers are in the field, with the crew. With future manned missions to Mars, we may need similar crew autonomy. In that sense, NASA can also learn something from the meteorite hunters." Dutch astronomy writer Govert Schilling visited McMurdo Station and the Amundsen-Scott South Pole Station as a selected member of the U.S. National Science Foundation's 2012/2013 media visit program.